This way git doesn’t ask anymore for user / pass when you try to push / pull from a repository givind us the posibility to automate things. Automate code pushing to servers . Automatic folder sincronisations with a git repo and much more . Create a directory ( ex test2 ) and change directory to it. in debian directory you should modify rules file , then if necessary source/include-binaries , add your module in modules directory and modify README.Modules-versions to reflect your changes . Yii Framework it’s a php framework that will help developing Web 2.0 applications. First step in using this framework would be to install it. What you will typically need for developing a decent application: an apache / php / mysql / memcache server. If you are using TFM server all requirements are already met . 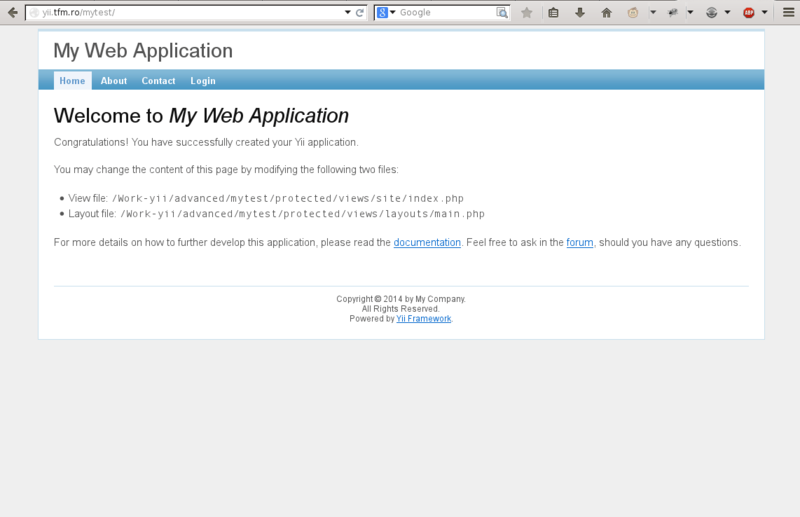 Download the framework itself from: http://www.yiiframework.com/download/ and unpack it in /www/yii directory. Answer yes and it will generate your skeleton application that will be the base of your application. If you don’t have an Oracle account you will need to create one. At the time of this post the following files are available: instantclient-basic-linux32-11.2.0.1.zip , instantclient-sdk-linux32-11.2.0.1.zip . Then you will need to install libaio if you don’t have it already . Don’t forget to add /opt/oracle/instantclient/instantclient_11_2 to /etc/ld.so.conf . At this point you are ready to install the pecl extension to php.Create a temporary directory ( /tmp/1 ) and cd there. And enjoy oracle extension for php. Note: if you have apache running restart it.